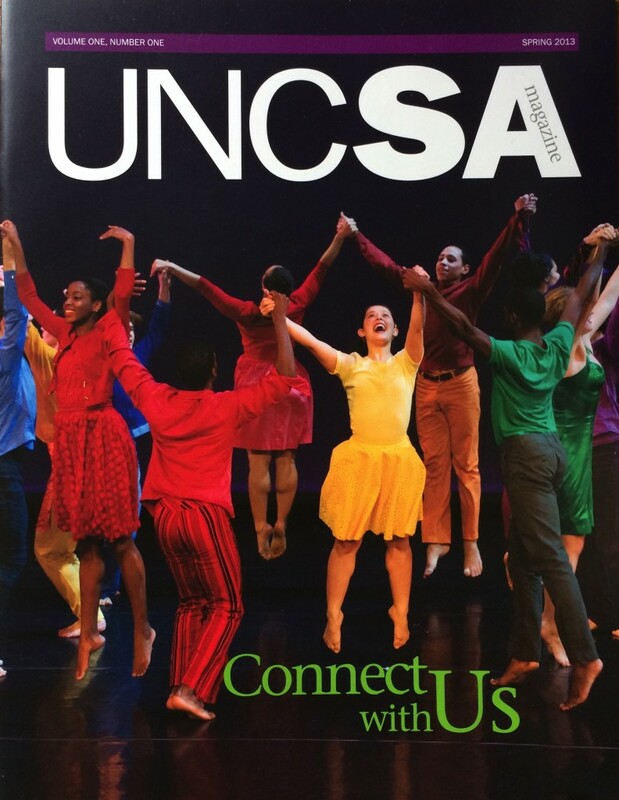 The phrase, “angels in the architecture,” written by Paul Simon, has been ringing in my mind since last May’s Modern Atlanta Dance Festival, when Daniel Gwirtzman and three of his New York-based company members debuted part of this larger work [The Oracle]. Choreographed by Gwirtzman the quartet offered fresh perspective on modern dance’s formal values with sparkling sweep and joyful physicality. At its heart, The Oracle was about the intersection of people. Like moving armatures, dancers gave form to space with mathematical elegance and human warmth. Their outstretched limbs arced and crisscrossed as they leaned in and sprang off of one another, weaving ever-changing configurations in a vision that vibrated on a frequency of harmony and brilliance. A highlight will be New York City-based artist Daniel Gwirtzman’s contemporary piece, Together, in which dancers are literally connected throughout the duration of the work. Together was danced beautifully by Heather Roffe and Courtney World. The dancers, who were literally attached to each other the entire piece, explored virtuosic and dynamic movements while keeping at least one hand in the other’s pocket. This was no easy feat, but both dancers were strong, focused and articulate in their bodies and it made for an absolutely breathtaking performance of complexity. 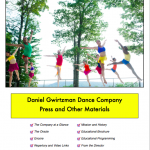 Perhaps one of the strongest pieces of the whole program, Together was choreographed by Daniel Gwirtzman, whose repertory is known for a range of moods and styles. 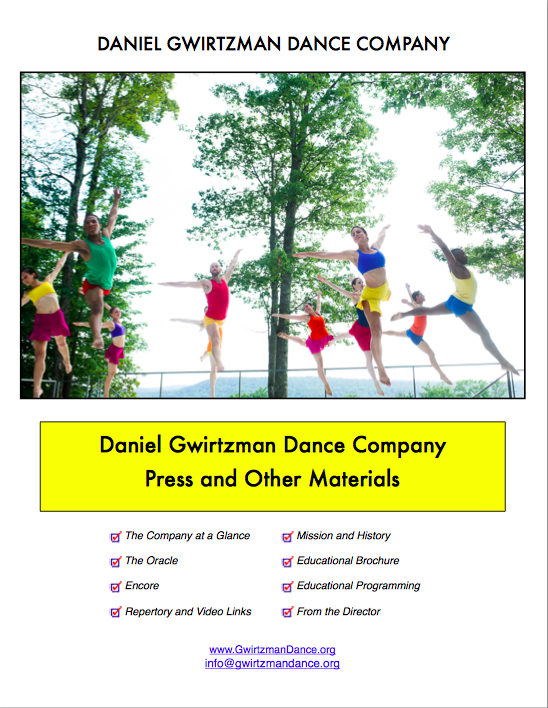 Daniel Gwirtzman Dance Company collaborates with the NYC Department of Education and college dance departments around the country. The clarity in his choreography was not only pleasing to watch, but complex to consider as well. Writer Madeleine L. Dale reviews Mapping, Attitude Magazine, Vol 26, No. 3, published August 2015. Mr. Gwirtzman was a personality-less Everyman whose methodical, crisp, clocklike movements were robotic. He progressed forward and backward with his arms shooting out or up, parallel to each other and stiff, in a manner markedly unlike the natural swing of arms when one walks. He repeatedly ended steps with a loud slap of fist into palm, the sound of wordless frustration. Determined, the stolid, unblinking character forged on in a consistent vocabulary. His only variation was to accelerate. This yielded short-lived, slightly softer, Tai Chi-like perturbations, until Mr. Gwirtzman dropped, prostrate, arms outstretched. The setting of his fingers one by considered one riveted him to the floor and the audience to him. On his belly, Mr. Gwirtzman bent his knees, raised his legs together, and leaned them slowly to one side, almost rolled over, but each time he made the effort, he fell back to the flat, face-down, position of defeat. How like us to keep trying the same hopeful, ineffective action, over and over. Mr. Gwirtzman has created a work that is amusingly described as “a 40-minute solo for the dancer who has been with him the longest … himself.” Called “The Lecture,” it is set to a score of recorded lectures on mathematics, human evolution, the history of language and the like. It should be fun to see what Mr. Gwirtzman, a lanky, supple mover with a nicely ironic sensibility, does with that. Gradually building up from a solo into a quartet, Timebomb doesn’t explode all at once. 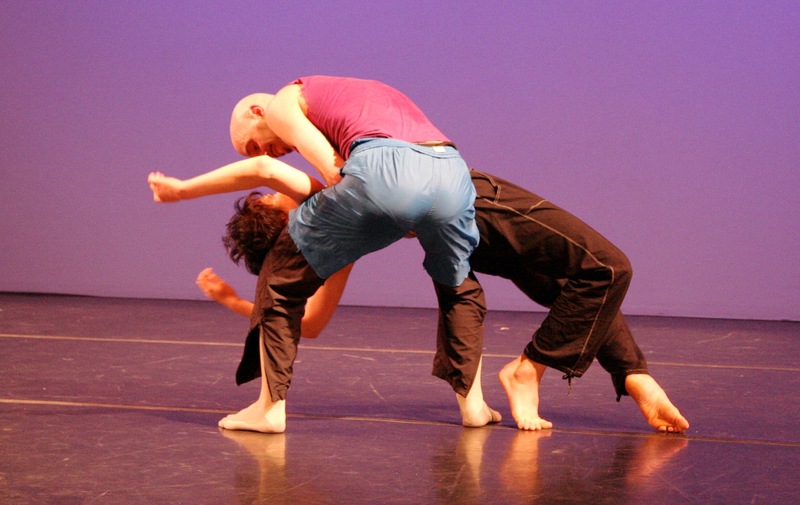 Instead, eyeing each other warily as they work in the round, negotiating handholds and counterbalances in fraught encounters, the dancers suggest participants in the kind of complex schoolyard game that can turn brutal in an instant. No matter how many dark pieces Daniel Gwirtzman has turned out since starting to choreograph in 1995, he’s clearly a not-so-secret jazz baby who’s also a fan of Broadway.I’m a pushover for dancers who can play themselves in unaffected ways-as these do extremely well-but the calculated informality could be cloying were the choreography not interesting in itself. None of Gwirtzman’s “numbers” are glitzy stuff or slick Broadway jazz. He gets under the skin of the music he loves-blending casualness and precision. It’s great to see imaginative dancing to music like this. I found myself grinning from one end of the piece to the other. Gwirtzman has made a spring fling, showing us the underside of the dancer’s world, letting us feel the sensuality of the studio and glory in the music of the first half of the 20th century. It’s heartening when one finds dance that can evoke dramatic situations and rivet the attention with sharply etched, well-crafted choreography—without resorting to bells and whistles to augment, or supplement, its ability to communicate. In ‘Chapters,’ a two-part, 90-minute work, Daniel Gwirtzman limits his theatrical trappings to elegant, persuasive lighting design and simple, functional costuming. His movement has a slippery elegance and precision, incorporating gestural elements, yoga moves, and a lithe expansiveness, and in the course of the work’s 18 short sections, it manages both to charm and unsettle…intriguing confrontations and complex relationships were skillfully evoked through deft partnering and economically shaped sections. I appreciated the matter-of-fact performance manner, the crisp, smooth execution of the interestingly shaded and precisely delineated movements, and felt throughout that I was watching the work of someone very much in control of his craft. ‘Chapters’ followed an evocative, if sometimes mystifying path, and Gwirtzman always made it clear that important matters were at stake. Still happening is Gwirtzman’s movement from the chest, especially in a particularly lugubrious, crab-walking, gelatinous, sinewy Act Two dance he built on himself. There are still the touches of contemporary pop and hip-hop that he does so well and the great musical choices, especially in the accessible, pleasing duet “We Have Love,” that could stand alone—a terrific encore number. After the considerable miming of Act One, Act Two offered more complex, “new” movement. The couple in their coming together and coming apart do so in facing each other with curving upright slitherings becoming convex when the other is concave. The family becomes literally entangled—wondrously complicatedly. Because Ignacio is pellet-sized, he is easily lifted. In many forms of “X” the taller dancers are the base, while Ignacio moves on them. They often begin connections with a simple push of one ankle to another resulting in complex intertwinings and some beautiful, simple lined lifts, as when McWilliam, amazingly strong, holds straight-as-a-board Gwirtzman on an angle. For his part, Ignacio looks like a gymnast and moves like one. Many of his moves are presses to handstands as he works out the character’s masculinity…marvelous, technically terrific dancing and the complex, fluid choreography. With warmly lyrical Cary McWilliam and tiny spitfire Jason Ignacio, Gwirtzman, himself a rangy man who can command a stage just by spreading his arms, offers ‘Chapters,’ an evening of intimate dances that explores the emotional trajectory of relationship between a man and a woman, a man and a boy, and a man and his inner demons…His ideas about his work never interfere with their delicious physicality; a fluent, anatomically diverse ensemble executes the intensely focused dances. “Chapters,” Gwirtzman’s episodic new work for himself, Cary McWilliam, and Jason Ignacio, depicts a man and a woman as they meet, fall in love, and have a child. Brave enough to depict the child’s joy in learning to walk (convincingly portrayed by the compact Ignacio) along with the woman’s vanity and the man’s violence, Gwirtzman nevertheless keeps the explicit relationships mostly abstract, allowing them to inflect his agonistic acrobatics. What really makes dance fun is when it makes fun of itself. To the opening-night audience’s delight, New York’s Daniel Gwirtzman Dance Company did just that. Clad in tropical whites, the six dancers shook their buns in “Sway” while Dean martin crooned “Dance With Me.” Doing simple merengue steps and sweetly smiling at the audience, they seemed to say, “Isn’t this terrific?” In “Interlude,” vocalist Kate Edwards’ rich, throaty voice moved the show up another notch in sophistication, so that by the time the moodier, pure-dance piece “Cycles” began, we were ready to see what makes dance beautiful. Gwirtzman began with a simple theme–the impressive Oren Bar-Noy in a sheer purple T-shirt opens with a solo, then leaves the stage to the others, reuniting with them as the elliptical piece comes to an end. Gwirtzman’s runners falling in love on the jogging path in “Intoxication” had all the components of a cinematic love story crunched into a few glances, double-takes and unwanted intrusions. And the duet in “Chanson D’Amour” ends with the boy expressing his crush with an endearing handstand. Someone forgot to turn on the air conditioner, but the dancers turned in such a bravura performance that no one left. Fringe director Nick Stuccio promised it would be on for the rest of the run. So, no doubt, will Gwirtzman and Company. The Daniel Gwirtzman Dance Company is continuing to challenge the limits of what can be explored in modern choreography. Choreographer Daniel Gwirtzman offers fetching dances that display nuanced musicality and notable choreographic craft. “Cycles,” the program’s finest offering, a gripping series of abstract, four-bodied sculptures, animated by surprising jolts of energy and cunning games of weight and balance. The riveting drama lies in the work’s formal design and the dispassionate clarity with which it is performed. The most evocative piece on the bill is its darkest, “Cycles.” Here Gwirtzman abandons the hope buoying most of his dances to take on darker themes…it is beautifully choreographed and the spotlight sweeping the audience lends an apocalyptic cast. Daniel Gwirtzman Dance Company’s concert at Joyce SoHo consisted of thirteen chamber-scale danced vignettes. On closing night, his striking cast performed with great comfort within the physically demanding material, filling its extended lines. Varied in impact individually, together the sections packed a magnified emotional presence…Among the strong images of the evening was a duet for Gwirtzman and Ignacio within the trio “Scenarios,” which made nice use of their difference in size, returning to a motif of struggle but also arching to transcend gravity. The short solo, “Lone,” was a too-brief highlight wherein Christian von Howard controlled spatial specificity while maintaining a loose natural physicality. A duet for Ignacio and McWilliam, “Coupling,” was repeated without noteworthy variation, first facing front and then to the side. Yet it was curiously satisfying to watch from a second angle, a choreographic stratagem also seen in the work of Senta Driver. A duet performed by Bar-noy and Lindsey Dietz Marchant, “Getting Ahead,” built from the bob and weave of defensive one-on-one basketball with a subtext of domestic violence, was also repeated twice, with roles reversed. “Cycles” featured welcome compositional complexity and organic rhythm. Black costumes against squares of light projected on the back wall nicely defined a space where bodies became hyper-real, but were allowed occasional human imprecision…the audiences were clearly pleased. A troupe I’d follow anywhere: perfect magnifying glasses for the choreographer’s quirky ideas. They brought exceptional vitality to each work’s compact vignette. Top marks go to Ignacio in “Scenarios.” His expressiveness and wondrous athleticism heightened the pain of watching the dancers’ harsh interactions. Children often find the adult world sober and dull. Imagine, then, their pleasure at discovering a profession in which grown-ups not only go barefoot and wear funny clothes, but also run, twirl and leap with abandon. That profession is modern dance, to which Daniel Gwirtzman and his company provide a delightful introduction. “Welcome to the World of Dance” explains what contemporary choreography is all about. The dancers then take the lesson several thrilling steps further by inviting the young audience members to join in. Mr. Gwirtzman first leads the children through some simple warm-up exercises in their seats. Bare feet can feel the floor better, he explains, adding, “Imagine trying to to play the piano with mittens.” The troupe then performs a program of music that is lively and fun, like ragtime and big band, and dances that are too, like the Charleston and the can-can. As Matthew, my 5-year-old, demonstrated, an hour-long performance is bound to elicit questions, from the expected (“Whoa, how’d they do that?”) to the unexpected (“Mom, do both of them have underwear on”). For him and his fellows, the high point was going onstage to learn the hora, an Israeli folk dance, and the bus stop, a 70s disco creation that includes the pose that John Travolta immortalized: index finger pointing to the sky. By the time the last strains of the score from “Saturday Night Fever” were heard, most of the adults were on their feet, too. Opening night, July 22, 1999, one of the hottest of the New York summer. Even the audience suffered for its art, and it was glorious, absolutely spell-binding. In addition to a charming program by which the generous choreographer offered photographs and paragraphs on each dancer, press materials included an explanation of this “dance about time, evolution, and the future…” It is good reading on its own and some of it helped, in that it revealed that the choreographer is an unusually and thoroughly sensitive, aware, and thoughtful person. Also, it did explicate the sections, “Grid,” “Cell,” “Volcano,” “Atom,” “Sanctuary,” “Magnetism,” and “Stream,” but it was the effect of the whole, unexplicated, that speaks to the piece’s, or rather, the creator’s success. This very dense, detailed, at once flat and expressive constant movement consumed and enveloped the audience such that the questions, “Where are we heading with all this became dizzyingly clear and equally terrifying to the audience as to Mr. Gwirtzman, and felt like new, original questions that, horrifyingly, we had never thought about before! There was no escape, and even though Mr. Gwirtzman describes this as a “lengthy dance,” it flew by, despite/enhanced by the soggy, suffocatingly airless set up nature shaped (the sultry steam bath environment of the un-air conditioned Merce Cunningham Studio). All movement is matched, even to the crooks of fingers and the technique of slow motion rolls on the floor. Dance is danced, however moved by magnetic forces, rushes of air, pure will, or autonomic response. The lines are always elegant, even when knock-kneed…All this variety is unified by the polish of the performers in their exact representation of the choreographer’s choices… Mr. Gwirtzman, in a note to the press, wrote, “I have invested everything I have, and even what I don’t have, into this production,” in this case it was literally blood, sweat, and probably not a few tears. Fortunately, this healthy choreography from a physically active mind is likely to keep the creative juices flowing and regenerating. Even if we have to wait another three years, it will be worth it.